Meanwhile, King Henry VIII is 45 and increasingly desperate for a son to secure his legacy. He left his first wife, a princess of Spain, changing his country’s religion in the process, to marry Anne Boleyn -- but she too has failed to deliver the promised heir. As Henry begins to fear he is cursed, Jane Seymour’s honesty and innocence conjure redemption. Thomas Cromwell, an ambitious clerk who has built a career on strategically satisfying the King’s desires, sees in Jane the perfect vehicle to calm the political unrest that threatens the country: he engineers the plot that ends with Jane becoming the King’s third wife. Jane believes herself virtuous and her actions justified, but early miscarriages shake her confidence and hopes. How can a woman who has done nothing wrong herself deal with the guilt of how she unseated her predecessor? Janet Ambrosi Wertman grew up within walking distance of three bookstores and a library on Manhattan's Upper West Side - and she visited all of them regularly. Her grandfather was an antiquarian bookdealer who taught her that there would always be a market for quirky, interesting books. He was the one who persuaded Janet's parents to send her to the French school where she was taught to aspire to long (grammatically correct) sentences as the hallmark of a skillful writer. She lived that lesson until she got to Barnard College. Short sentences were the rule there. She complied. She reached a happy medium when she got to law school - complicated sentences alternating with short ones in a happy mix. Janet spent fifteen years as a corporate lawyer in New York, she even got to do a little writing on the side (she co-authored The Executive Compensation Answer Book, which was published by Panel Publishers back in 1991). But when her first and second children were born, she decided to change her lifestyle. She and her husband transformed their lives in 1997, moving to Los Angeles and changing careers. Janet became a grantwriter (and will tell anyone who will listen that the grants she's written have resulted in more than $20 million for the amazing non-profits she is proud to represent) and took up writing fiction. There was never any question about the topic of the fiction: Janet has harbored a passion for the Tudor Kings and Queens since her parents let her stay up late to watch the televised Masterpiece Theatre series (both The Six Wives of Henry VIII and Elizabeth R) when she was *cough* eight years old. One of the highlights of Janet's youth was being allowed to visit the Pierpont Morgan Library on a day when it was closed to the public and examine (though not touch!) books from Queen Elizabeth's personal library and actual letters that the young Princess Elizabeth (technically Lady Elizabeth...) had written. Janet is thrilled to finally be releasing the first book in The Seymour Saga series: Jane the Quene will come out on April 14. The second book, The Path to Somerset, will chronicle Edward Seymour's rise after Jane's death to become Lord Protector of England and Duke of Somerset - taking us right through Henry's crazy years. Finally, the third book, The Boy King, will cover the reign of Jane's son, Edward VI, and the string of betrayals he suffered. Easy to read. Enjoyed this book. I gave this book 5 stars because from start to finish it kept me interested. I love the Tudor period but you can easily find yourself reading about the exact same events over and over. Jane the Quene stood out for me for several reasons. One was the fact Jane Seymour is our main subject. I have only read about Jane in the inclusion of another main character's story, usually Anne Boleyn. It was wonderful to see a possible story of where Jane was before she comes into the whole courts notice. Or what Jane might of been thinking while being courted by Henry VIII and when Anne was executed. My only draw backs where when history and the storyline didn't match. I can't really give examples without giving spoilers. Then I realised that all these times were when history can only give a educated guess that has been absorbed more as fact. I would recommend to put what you think you know aside and just let the story take you. After all, what else can we do but imagine Jane Seymour's thoughts and feelings on the world around her. I would recommend this book to anyone who loves the Tudor period. A GREAT escape to Tudor England. In this new book and part one of a Seymour trilogy, Janet Wergman has taken on the unenviable task of turning a “boring” woman into an interesting study. Did the name Plain Jane originally come from her? Any basic study of Henry VIIIs wives tend to give Jane short shrift as the antidote to the exciting and tempestuous Anny Boleyn. And of course, Henry loved her the rest of his life because he didn’t have the opportunity to get tired of her. Oh, and she gave birth to his heir. But there were a lot of unanswered questions in the Jane Seymour story. How could a shy, unspoiled, sheltered girl find herself in the compromising position of wanton replacement for a pitiful queen about to be executed? And with such haste! There have been so many fictional assertions that Henry married her with a day or two of Anne’s beheading, that I had to go back and track the passage of time between Anne’s execution (May 10), Jane’s betrothal to Henry (May 20), and their formal wedding (May 30). The author helps us along by dating every section, including the time. Yes, it was hasty but Henry wasn’t sitting at her house waiting for the cannon to go off so he could marry her, which I remember from a long ago story. But still, it took some explaining to show how Jane got to this point, and Wergman has done a good job giving Jane a little ambition after all, and a rather sweet account of her early meetings with the King. It was all so innocent and comforting that I no trouble accepting it. As things got more and more complicated, Jane’s ambitions (or love?) got the better of her and she seemed to lose focus. She seemed to be a little confused as to what she was expecting out of this relationship, but as usual Henry was in charge and she could just go along for the ride. It helped that Jane didn’t really like her cousin Queen Anne anyway, so it wasn’t all that difficult to see a tiny bit of vindictiveness in her actions. Throughout, Jane’s brothers were most annoying, and it was good to see her get the upper hand in the end, forcing them to admit that she wasn't such a nonentity after all. She didn’t particularly appreciate being used to further their aims; on the other hand, she bought into their conspiracy of manipulating the king’s affections. It’s interesting to wonder at what point it felt OK to hanker after the crown, and more than once Jane thought she might have overplayed her game. For by this point, it seemed more like maneuvering than naivete, and I lost a little respect for her. Although there no surprises (and shouldn’t have been, I think), we do get a full three-dimensional depiction of this not uncomplicated woman. I didn’t find her overly likeable, but she is capable of capturing our sympathy. I found myself rooting for her, even though I like her predecessor. She had her own story to tell, after all, and secured a foothold in history. This was really the best fictional account of Jane Seymour I have ever read! And I freely admit to being something of an aficionado regarding Henry VIII's third queen, who so often stands in the shadow of the exciting tumult surrounding Anne Boleyn's meteoric rise to power and subsequent spectacular fall. This novel showed Jane to be more than meek and mild, yet not grasping either. She simply wanted a husband, like most noblewomen of her day. She didn't initially plot for that husband to be the king. Yet when he showed interest, she knew it was her chance to have what she most desired: a life of her own as a married woman of substance. In Janet Wertman's capable hands, the character of Jane jumps into view as a forceful figure who overcomes the challenges posed by her family (who does not support her) to win the heart of the King. 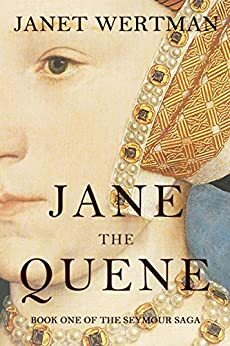 Jane "the plain" uses her wit and agency to become Jane, the third wife of Henry — and the Queen who will finally provide him an heir to the throne. This book reads like a "romantic novel" but has the strength of academic biography with literally decades of research behind it. The detail is accurate and astounding. For instance, Jane and Henry fall in love in the pantry. What are they doing in the pantry? Wertman describes the particular medicinal herbs Jane is collecting, and, in the ultimate "cute" meeting, these herbs are the very medicines that Henry is using for his various maladies and to scent his rooms. Henry and Jane have an immediate attraction. Henry has found a woman who is his intellectual equal and in many ways his moral compass. However, the attraction is mitigated by the pesky fact that Henry is already married. To make matters worse, Henry's wife becomes pregnant. When Henry's wife miscarries, the novel goes into high gear — more thriller than romance. What life and death obstacles must be overcome? What internal politics must be considered? What international relationships must be maintained? At the heart of this thriller, Jane must learn how to handle those challenges with the grace, morality and good will that made her the woman that Henry loves. This balancing act describes the blossoming of a "plain" Jane into the formidable "Queene Jane". I'm hooked and ready for the next book in the trilogy. I have long been intrigued by Tudor fiction, and how long I am willing to stay with fictional accounts when I know the historical end. I read this book almost straight through and thought the author did a marvelous job telling the story. Waiting for book 2 of the series.